One of the most fascinating things about game design is that it never ceases to be challenging. Every time we make something we get to discover new problems and eventually feel triumph as we devise new solutions. Even if a game we make is never actually played (or even seen) by another person, we get the rush of solving it on paper, and that feeling never goes away for as long as we continue to create new things. In general, children are much more imaginative and creative than adults. This is because there is an inherent power in naivety when it comes to our willingness to explore our ideas and ultimately share those ideas with others. For instance, in the 3rd grade I didn’t stop to ask myself whether or not the world need another fantasy RPG, I just wanted to make one and so I did. That doesn’t mean that we can’t recapture a bit of that feeling as we get older though. When we begin to approach the world with a “what would happen if…” mentality it allows us to practice problem solving skills that we can then take into other aspects of our life. Designing games lets us do this again and again. As far as hobbies go, game design is one of the cheapest ones I can think of. Let’s put it this way, I spent nearly as much money buying board games last month than I think I ever have on designing them. Like most hobbies, there are certainly ways that one can spend money in game design – I’ve personally had my eye on a few really nice paper cutters recently- but looking at the bare minimum cost for getting started, it’s basically free. Anyone can get by in the beginning with some scraps of paper and a writing utensil. Aside from people watching, I can’t imagine there are many activities with lower barriers to entry than game design. The game design community is filled with friendly, creative, and inspiring individuals who love to share their passion with others. When I first dipped my toe into the arena I was shocked to see how supportive everyone was of one another! There is a camaraderie that exists within the game design community unlike many that I have ever been a part of, and it is incredibly refreshing. Imagine a group of friends that are really into games, yet possess an empathy that can only come with the vulnerability of sharing something you’ve created with others – that’s the game design community! Best part is, you don’t have to be a published designer to engage, all you need is an interest and a willingness to spark up a conversation. Game design is a neat hobby because it combines intellectual problem solving with the craft of actually creating something. When I am feeling like challenging myself, I’ll try and come up with some interesting new combinations of mechanics or new design ideas. When I feel like relaxing and zoning out, I’ll throw on an episode of the Great British Baking Show and cut out some cards or make some game pieces. It’s a hobby that can provide for fun and engaging social interaction, but can be done solo when you just want some time to yourself. Eventually, you’ll get a prototype of a game together and decide you want to refine it and play it with others. You’ll also want to return the favor and test some games created by friends you have made n the design community. This is when game design gets to teach you another fine life skill – the giving and receiving of feedback. You’ll learn how to take criticism of your work for what it is, how to sift through unproductive feedback to find useful feedback, and ultimately how to provide feedback for others in order to make their creations the best they can be. It sounds lofty, but game design has helped me become a better communicator and it has helped me to become much less defensive when receiving feedback in other areas of my personal and professional life. I recently designed a trick-taking game for a game design contest. Before I began I didn’t really have any particular affinity for the genre, and while I had played traditional trick-taking games like Hearts and Spades I had never considered myself a big fan. 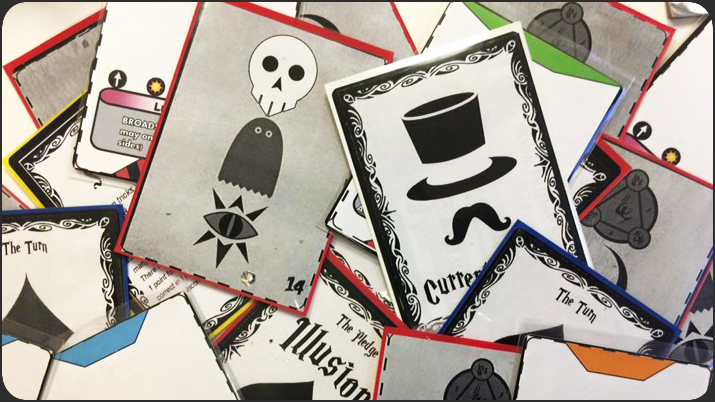 When tackling the problem of how I would design a trick-taking game, I began to conduct research and learn what it was about trick-taking games that made them tick. It turns out that I really began to fall in love with the mechanic! If it wasn’t for me deciding that I wanted to make one, I may have never jumped into them again. Game design encourages us to continually ask questions and to push ourselves to try new things, because behind every game we don’t like there may exist a discovery that changes our mind or alters our perspective. When we peel back the layers to see what makes some of our favorite games work, we’re able to better identify games we should try in the future. Game design helps provide us with some of the tools and vocabulary we need to begin that process. In addition, game design allows us to go through a very similar process to the one that resulted in some of our favorites, and we can begin to see why some of the mechanics in some of our favorite games exist. It’s a bit akin to having an understanding of cinematography and watching a movie that was shot well. The average person might chalk it up to raw talent and luck, but those in the know can greater appreciate the skill and the technique. As with any other form of crafting or creation, there is value in creating something that you can be proud of. This is a peculiar reason because I think it is our lack of confidence that causes us to not create something in the first place “it won’t be good” or “it won’t sell” or “I’m not a designer.” When we remove that fear and embrace the goal of making something for oneself, and not for others, then it is an incredibly freeing experience. There is value in designing a game on paper and crafting a prototype, even if another soul never sees that game. Setting goals, solving problems, and creating things for the sake of creating them is reason enough to do it. Don’t let the goals or expectations of other people get in the way of personal accomplishments. 3rd grade me had this one right all along. Designing a game is fun! Whether it starts with a wacky theme or with a neat mechanic, the process of being creative and knowing that whatever you can imagine you can make is super enjoyable. Clearly, I’d recommend it. There you have it! 10 reasons why you should design a game that have nothing to do with anybody else. What are some of the games you’ve thought of but haven’t got around to trying to design? If you are already a designer, what reasons might I have missed? Sign up for our mailing list to receive updates and game design tips sent to you each month! Hacking is the best way to begin designing games.